Canada’s women’s sevens team finished in second place at the Kitakyushu Sevens after losing to New Zealand 17-14 in the Cup Final at Mikuni World Stadium Kitakyushu in Japan. It was Canada’s second Cup Final appearance in three events and the result earned them another 18 points in the HSBC World Rugby Women’s Sevens Series standings where they remain in third place with 64 points. Canada gained two points on Australia who still sit in second place with 66 points while series leaders New Zealand extended their lead over the Aussies to 10 points with their third cup title of the season. Canada fell to 0-3 all-time vs New Zealand in Cup Finals. Canada advanced to the final with an impressive 33-0 win over Australia in the Cup Semifinals. The 33-point win over Australia was historical, as it marked the largest ever win in the head-to-head matchup. Earlier in the day, Canada defeated Russia 41-0 in the Cup Quarterfinals. The 41-point win was also Canada’s largest ever victory in the all-time head-to-head matchup with Russia. Canada’s win over Australia in the semifinals was the team’s 100th all-time win on the series, becoming just the third team ever to do so behind Australia and New Zealand. After going three from three on day one action, Canada hit another level in their cup quarterfinals, dominating a talented Russian side in a convincing 41-0 win. Canada scored early and often, and put in a strong defensive effort to pick up their first shutout of the tournament. Captain Ghislaine Landry opened the scoring in the first minute with a converted try to give Canada a 7-0 lead. Julia Greenshields continued her impressive play this weekend with a brace in three minutes and all of a sudden Canada held a 17-0 lead just before the hooter sounded. With the clock still running, Jen Kish scored a fourth first half try for Canada and Landry’s conversion made it 24-0 heading into the break. 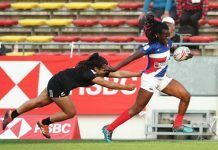 While Canada held a big lead, there was no letdown on defence, as Landry Bianca Farella and Natasha Watcham-Roy teamed up for a chase down tackle to prevent a Russian try. Landry added another converted try in the ninth minute to extend the lead to 31-0. Landry then connected with Charity Williams on a long kick and chase and as Williams went to ground her first-touch found a streaking Landry who ran in for the try. Watcham-Roy would add another try in the final second to give Canada an historical win over the Russians. Never has Canada dominated the reigning Olympic Gold medalists as much as they did Sunday in what turned out to be the most lopsided victory ever in the all-time matchup. The weekend trend continued for Canada, who dominated possession throughout the match. Canada were led by Julia Greenshields who picked up a hat trick, pushing her tournament try total to eight. Breanne Nicholas and Britt Benn added two second half tries to cement a place in the Cup Final. While Australia were missing some key players, nothing should be taken away from Canada’s performance in the Cup Semifinal. It was a total team effort and it showed that the Canadians are the team to beat this weekend in Kitakyushu. It was a heartbreaking ending to a terrific weekend of rugby from Canada as New Zealand ripped away victory with a last second try to capture their third cup title of the season. Had Canada won, they would have drawn level with the Black Ferns with two cup titles apiece. It was a promising start for the Canadians, who scored the first try of the match through a reaching Hannah Darling. Captain Ghislaine Landry stepped up and nailed the conversion from a difficult angle to give Canada a 7-0 lead. New Zealand would respond with a converted-try before half as both teams went into the break tied 7-7. Canada pushed ahead after Landry and Jen Kish teamed up for a try as the friends played off one and other before Kish touched down. Landry once again hit a difficult try and Canada restored their seven point lead. New Zealand answered with another try to cut the lead to 14-12 and retained possession off the restart after Canada was unable to secure the ball. With the hooter sounded, New Zealand used the final possession to run a few phases before finding an overlap on the Canadian defence to score the game-winning try.